How We Create Programs: We Listen to You! Have you ever thought about how museums come up with their programming? Think about a field trip you’ve been on, a tour, a lecture, a special event sponsored by some museum, zoo, historic house, arboretum, aquarium—an experience that you just loved and that really made an impression on you. Why did the museum or other institution decide to focus on that subject? Or why did it offer the program at that particular time of day? At the time, why did it seem like that experience was made just for you? I can tell you from the inside, it wasn’t just a happy coincidence or mere whim on the part of the institution. Any museum worth its salt, and especially anyone who creates programming (read museum educator! ), knows that in order to be successful, you have to listen to the needs of the community. There are lots of ways to do this. The National Law Enforcement Museum uses vehicles like our Facebook page and this blog to get immediate feedback from our national community. We’re developing partnerships with local schools that will help us shape the school programs we’ll offer to students from all over the nation once we’re open. And we’ve assembled a knowledgeable, savvy, national group of advisors with expertise ranging from museum education to law enforcement to civics to socially responsible museum programming to offer guidance. Our Education Advisory Committee is one organized way we listen to all the different communities we want to reach. So now I’m curious. Who do you think the National Law Enforcement Museum’s community should be? Who should we make extra efforts to reach out to as we develop programs we’ll offer now and in the future? In order to make a program, tour, activity, or whatever seem like it was created especially for you, what should we include, or what would it look like? Please leave a comment and share your thoughts! For four years we have been developing the collection of the National Law Enforcement Museum. One would think that, given the nature of policing, the bulk of what will be in the Museum’s collection is of a serious nature: uniforms, equipment and other tools of the trade, photographs of officers doing their work, items related to bad guys, materials to help us live safer lives, and so on. Indeed, of the over 8,000 items in the collection, the majority of the objects in our collection do represent the serious side of policing. But it’s February, and it’s almost the end of winter. Valentine’s Day is the 14th, and almost everyone’s attention turns to Cupid. 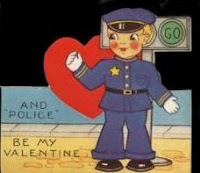 We have acquired two valentines that relate to policing—and I’m happy to share those with you. Police valentine, ca. 1940-1950. 2006.268.1. Collection of the NLEM, Washington, DC. 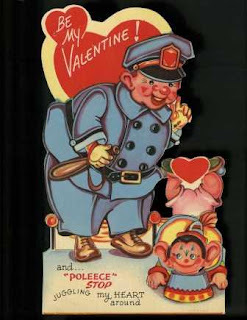 Police valentine, ca. 1940-1950. R0814. Received by the NLEM, Washington, DC. 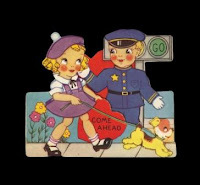 If you have any information on these valentines or have thoughts to share about the connection between law enforcement and valentines, we would be delighted to hear from you. We're delighted to announce that Laurie Baty, post card collector, photography expert, and intrepid Senior Director of Museum Programs here at the National Law Enforcement Museum, was recently selected to be a peer reviewer for the American Association of Museums' Museum Assessment Program. It's an exciting opportunity, not only for Laurie, but also for our developing museum. This honor recognizes Laurie's three decades of experience in the museum field, as well as her knowledge of best practices and current standards. As a peer reviewer, Laurie will assist museums going through a self assessment process that's designed to help them maintain and improve their operations. Through her work, she'll also learn more about what other museums are doing, strengthening our museum, too. This volunteer position takes lots of time and dedication, but we know Laurie is up to the challenge. Congrats, Laurie! According to a study on family violence, over 15 million children live in households where partner violence has occurred (McDonald, 2006). Witnessing domestic violence can affect a child physically, emotionally, and mentally, putting them at higher risk to be depressed, aggressive, and anxious (Edelson, 2006). These children also have trouble expressing themselves in a healthy way. In addition, boys who witness violence have an increased risk of becoming abusers in their future relationships and girls have a higher chance of being victims of dating and domestic violence (Pelcovitz, 2009). School is one place where a child can feel safe and shielded from the violence at home; teachers and school staff are often the only stable relationship the child has with an adult (Kearney, 1999). With that in mind, and with assistance from the Verizon Foundation, National Law Enforcement Museum program staff are creating a program to provide information and training to Washington-area teachers, school resource officers, and other school staff on what domestic violence is, and how witnessing domestic violence affects children. The training will also give school staff the tools they need to provide students with an outlet to get support and stay safe. The National Law Enforcement Museum is working on this program because domestic violence is a long-term critical issue for law enforcement. More officers by far are assaulted or injured during domestic disturbance calls than any other circumstance (Floyd, 2007). In addition, the very nature of law enforcement is to keep people safe. An important part of this program will be building respect, trust and confidence between school staff (including the law enforcement officers in the school) and their students. With this program, our goal is to make sure schools are not only safe, but also places where children can get the support they need. This initiative will support the Museum’s mission to encourage open communication and foster interaction between law enforcement and the community.